Please feel free to contact the Administrative Office of the Courts/Probation for information regarding any facet of the Annual Judicial Branch Recognition Program. Honorees will be chosen in the following categories. Click on each category for a description of eligibility requirements and the current recipient. Nomination form. Eligibility: This category recognizes exemplary performance by any probation support staff employee in the Nebraska Judicial System. The employee’s accomplishments or suggestions can be exhibited either through a sustained work and productivity record of exceptional efficiency, superior performance and dedication over at least a one-year period, or through an exceptional task. The accomplishments must be beyond normal expectations. 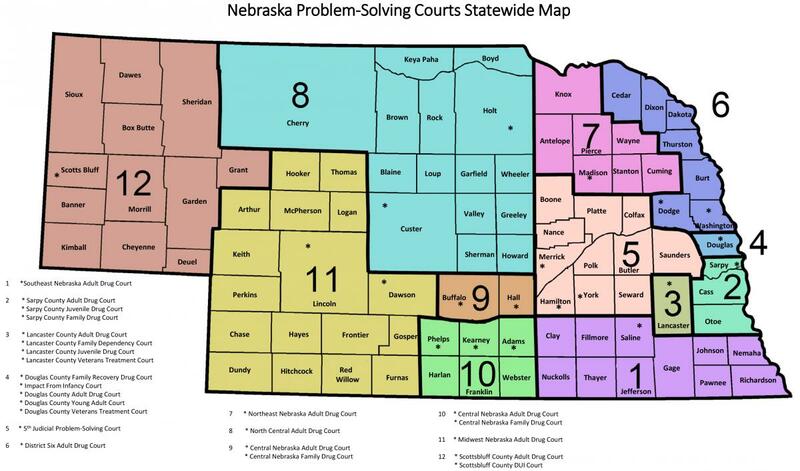 Eligibility: This category recognizes exemplary performance by any county court staff (non- supervisory) in the Nebraska Judicial System. The employee’s accomplishments or suggestions can be exhibited either through a sustained work and productivity record of exceptional efficiency, superior performance and dedication over at least a one-year period, or through an exceptional task. The accomplishments must be beyond normal expectations. Eligibility: This category recognizes exemplary performance by a Probation Officer. The employee’s accomplishments or suggestions can be exhibited either through a sustained work and productivity record of exceptional efficiency, superior performance and dedication over at least a one-year period, or through an exceptional task. The accomplishments must be beyond normal expectations. Eligibility: This category recognizes exemplary performance by a County Court Clerk Magistrate. The employee’s accomplishments or suggestions can be exhibited either through a sustained work and productivity record of exceptional efficiency, superior performance and dedication over at least a one-year period, or through an exceptional task. The accomplishments must be beyond normal expectations. Demonstrate exemplary leadership, providing a sense of purpose, vision and mission for their co-workers and/or staff. Positively influence others to build consensus around departmental or organizational objectives. Manage and lead change initiatives smoothly and effectively. Invest time and effort in coaching and/or mentoring. • Demonstrate exemplary leadership, providing a sense of purpose, vision and mission for their co-workers and/or staff. • Positively influence others to build consensus around departmental or organizational objectives. • Manage and lead change initiatives smoothly and effectively. • Invest time and effort in coaching and/or mentoring. Maintain a consistently high quality of service to external and internal customers. Anticipate clients' needs and potential problems. Serve as role models to others through positive interactions. Cost effectiveness of the suggestion, especially as it will relate to the entire Judicial System. Administrative improvements which enhance the delivery of services. Enhancement of morale or working conditions within the Branch. Suggested improvements, which relate to the quality of justice. Foster awareness, continuous education and communication efforts to showcase diversity initiatives. Exhibit disciplined efforts to learn, talk about and measure impacts of diversity. Establishment of programs or policies that reflect the importance of workplace diversity. Promote an inclusive, high-performing culture where all team members embrace each others' talents and backgrounds. Demonstrate an ability to educate others on how to build diverse people skills. Break down boundaries and/or create new relationships to improve work processes. Promote a work environment that is collegial, supportive, and characterized by positive morale. Cash award: $100/member of team, up to 10 members. If team consists of more than 10 members, the team will split equally a cash award of $1,000. Approach problems as opportunities for learning and growth. Take a proactive and innovative approach toward finding solutions to business and workplace challenges. Take the initiative to improve the value and efficiency of the services he/she provides. Take initiative to solve problems and improve work situations without being prompted. Is reliable, persevering and results-oriented. Consistently goes above and beyond.